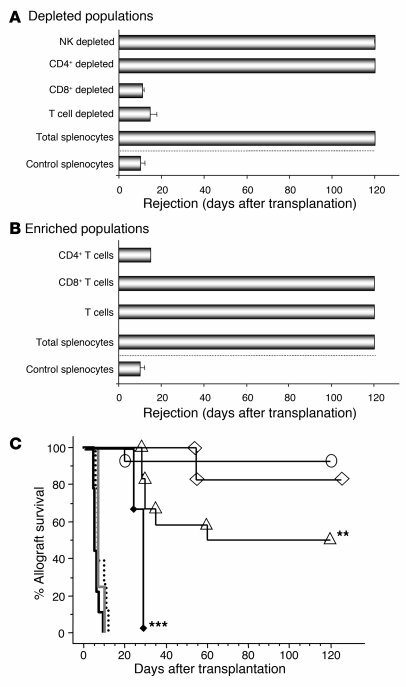 CD8+ T cells mediate transfer of transplantation tolerance after CD40Ig treatment. Cells from control rats that had rejected their grafts or from CD40Ig-treated recipients were injected i.v. the day of transplantation into LEW.1A recipients that received LEW.1W heart transplants (day 0) and that were sublethally irradiated (4.5 Gy, at day –1). (A) Total splenocytes (50 × 106; n = 6) or splenocytes depleted of T cells (n = 2), CD4+ cells (n = 2), CD8+ cells (n = 4), or NK cells (n = 2) were injected. (B) Splenocytes (50 × 106; n = 6), purified T cells (n = 3), CD8+ T cells (n = 4), or CD4+ T cells (n = 2) were injected. Graft survival was assessed by abdominal palpation of cardiac beating. (C) Grafts were either untreated (n = 9; thick black line), treated with a control mAb (3G8) (n = 6, gray line), transduced with Addl324 (5 × 1010 IP; n = 9; dotted line), transduced with AdCD40Ig (n = 27, black line with open circles), or transduced with AdCD40Ig and injected with a depleting anti-CD8 mAb (OX8) (n = 12; black line with open triangles) or an anti-MHC class I mAb (OX18) (n = 3; black line with filled diamonds). A group of control animals received the control mAb (3G8) in addition to CD40Ig (n = 6; black line with open diamonds). **P < 0.01, ***P < 0.0001 versus animals injected with AdCD40Ig or AdCD40Ig and 3G8.